As the fifth largest metropolitan area in North Carolina, Fayetteville certainly experiences its fair share of property crime. In fact, the All-American City experienced over 7,000 property crimes in 2015, according to 2015 FBI statistics, making it safer than only 11% of other U.S. cities. These are all reasons why securing your home in Fayetteville is so important. As a home security provider, Vivint brings you a lot more than just top-quality security features. You’ll also enjoy greater peace of mind, knowing you’ve taken the necessary precautions to protect your home and family. One of the best features of a Vivint Home Security system is that it can be fully customized to fit the unique needs of your property. Vivint offers a wide variety of window, door, and motion sensors, as well as cameras, smoke alarms, and automatic locks. That gives you a lot of flexibility to build your system with everything that you need—and nothing you don’t! Whatever devices you choose, you’ll get 24/7 monitoring, ensuring that you’ll get the backup you need when it matters most. Plus, your Vivint security system can be completely integrated with Vivint Smart Home products, allowing you to do things like monitor camera feeds from your phone using the Vivint Sky App. When you also consider all that Vivint has to offer, there’s really no comparison. Call now at 1-844-269-1056 to get the sense of safety and protection that only Vivint can provide! What Vivint Security Options Are Available to Me as a Tar Heel Town Resident? With Vivint, Fayetteville residents can choose how they secure their homes. Outdoor cameras and doorbell cameras are among the most popular security feature for Fayetteville residents because they make it easy to keep track of who’s coming and going. Pair it with smart door locks and you can even unlock the front door remotely when guests arrive—no more stashing hide-a-keys in a not-so-discreet fake rock! 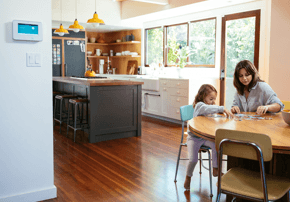 And you can get even more insight into your home with the Ping Camera, which connects to your phone via the Vivint Sky App to facilitate easy two-way communication system. That way, you can interact with anyone on the other side of your live camera feed. And of course, many Fayettevillians opt to include Vivint smart motion sensors, smoke detectors, and glass break sensors in their home security package in order to provide more complete protection for their home. When you consider that according to 2015 FBI statistics each person in Fayetteville has an approximate 1 in 28 chance of becoming a victim of a property crime, you really can’t be too careful. Protect what matters to you by signing up for Vivint home security today! Until recently, home automation was considered the stuff of science fiction. Today, however, having a futuristic smart home is totally within your grasp, thanks to Vivint! With Vivint Smart Home technology, you can enjoy easy home control via your Vivint SkyControl panel, a high-tech touchscreen device that puts control of all the automated devices and systems in your home at your fingertips. Light controls, garage door controls, appliance controls—you can manage it all right in one place. You can also control your home remotely via the Vivint Sky App. That means you don’t have to worry about the kids getting locked out of the house after school. Just whip out your phone, hit a button, and the doors will unlock. Vivint Smart Home systems can also be paired with your other smart devices. 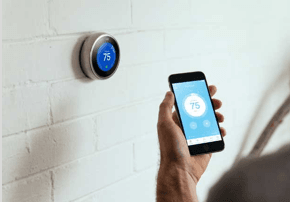 The Nest thermostat, for instance, can learn your temperature and humidity preferences, then automatically kick on and off at the right times to ensure your home is as comfortable as possible without wasting energy. When paired with the Vivint Sky App, the Nest can even use your geolocation to figure out if you’re coming home at a different time than usual and adjust accordingly. 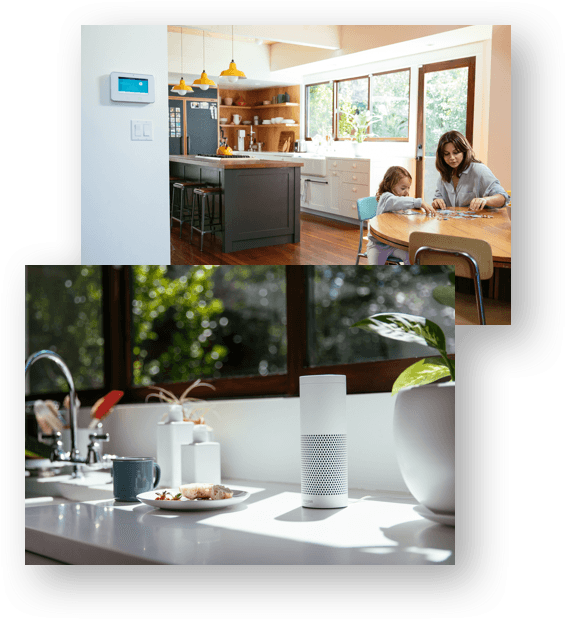 Vivint systems can also integrate with the Amazon® Echo to give you convenient voice control over your home security system, lights, locks, and more. 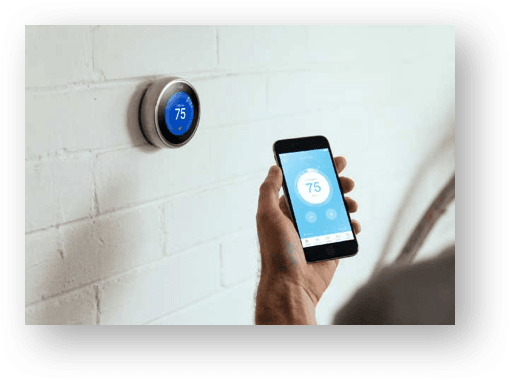 One of the biggest perks of choosing Vivint is the fact that your installation is fast, performed by a professional technician, and completely free. * Once you’ve ordered your package, a Vivint customer service representative will call to confirm your installation appointment. Your technician will then give you a completely personalized set-up, using their professional expertise to determine the best places to install your security cameras, motion sensors, and other equipment. And once the set up is complete, the award-winning Vivint customer service staff is available round-the-clock to assist you with any questions or issues that may arise. Another important thing to be aware of is that home security systems in Fayetteville need to be registered with the city Alarm Ordinance Coordinator. This is a common practice for many cities across the country, and it serves to make your property easier to find in an emergency, while also reducing the costs associated with false alarms. To find out more about how these local ordinances will affect your installation, just give Vivint a call at 1-844-269-1056! Did you know that 1 in 90 people in Lexington became victims of burglary in 2015, according to FBI statistics? With numbers like that, it only makes sense to protect yourself and your home. That’s where Vivint can help. With Vivint, you can enjoy round-the-clock monitoring, the latest technology, and convenient features that do more than keep you safe—they also make your life easier. Plus, Vivint packages are completely customizable, meaning you can build a package that works for your home, budget, and security needs, without paying extra for devices and services you won’t use. To get a quote on the right plan for your household, fill out the form below or give us a call today at 1-844-269-1056.